It would not really be accurate to say I was worried about what perfumer Christine Nagel would do when she took over as house perfumer at Hermès. Plenty of other things keep me up at night, but not that. But certainly I wondered if Hermès would continue to take the bulk of my perfume-spending dollars, or if I'd have to find a new BFF brand to empty my wallet every so often. What I think of as the transitional fragrance duo — Eau de Rhubarbe Écarlate and Eau de Néroli Doré — that marked the passing of the baton from perfumer Jean-Claude Ellena,1 added to the uncertainty, given that I lost interest in Nagel's Rhubarbe Écarlate within 30 minutes but fairly quickly bought a small bottle of Ellena's Néroli Doré (and I'm still sorely tempted by the matching body products). All of which might serve to warn you up front that Galop d'Hermès is no more of a leather bomb than Kelly Caleche or Cuir d'Ange. It's an oriental, but on the sheer side, with a lively, slightly quirky fruit opening (quince, berries and citrus) followed by a soft, saffron-y leather intertwined with rose. The leather is more leather-y than that of Cuir d'Ange, but only by a shade: we are still in Birkin-bag territory, not the stable. The rose is likewise more mild than than deep, with fruity and spicy nuances. As advertised, neither material dominates, indeed, a quick, casual sniff might not immediately call up rose or leather. Galop as a whole is warm (and the perfect weight for autumn) but not heavy; the feel is of restrained elegance. To my nose, it is completely unisex (I found it far less feminine than Kelly Caleche), and the lasting power is reasonable. Verdict: The stirrup bottle seems to be love it or hate it, but I love it, and as I said above, the juice is darned good. That said, I am not in love with Galop — I would not at all mind having a bottle, but I do not feel any burning need to own it. Good thing, because it's also darned expensive. The 50 ml is $210; for comparison purposes, Kelly Caleche is $119 and Jour d'Hermès Absolu is $118. What justifies the much higher price? It's apparently not the bottle, since the refill is also $100 more than the same size refill of the Jour d'Hermès Absolu. Perhaps it's the Parfum concentration? If so, it's not something I'd pay extra for as a consumer — regardless of what it cost to make, it does not wear differently from the brand's lighter concentrations, nor does it, like some Extraits, smell like it was made with bounteous quantities of rare natural materials. Galop d'Hermès is available in 50 ml refillable Parfum, $210. The 125 ml (shown just above) refill is $240. 1. Although Ellena's swan song, Muguet Porcelaine, came after. 2. 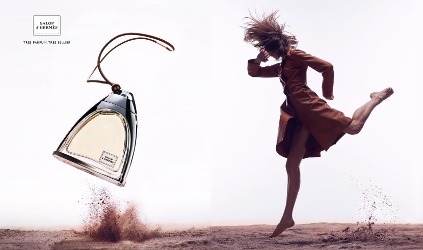 Via Hermès Rides High with the Launch of Its New Fragrance, Galop at Forbes. 3. Or three if you count Bel Ami Vetiver as contemporary. 4. Via Hermès Introduces the Most Hermès-y Fragrance Ever at Elle. I think this is very nice, especially the rose side of it. I have to really concentrate to see why it might be considered a leather scent. Rather, it seems more like what I’d hoped for from Rose Amazone (which I find too harsh). Galop will be good for fall. I’d be tempted to buy if I wasn’t trying to save money right now. That refill bottle is made for splits. I will agree with ‘very nice’, and yes, the refill bottle is definitely the way to go for splits if they don’t come out with a 15 ml. Neiman Marcus has it too, at least my local one does. I feel easier going into Neiman Marcus in flip flops, although perhaps they do not appreciate that sentiment. Oh I am dying to smell this. I didn’t realize it was that much more expensive than the other fragrances – that is not good news. I can’t wait to sample this. One more thing: Isn’t Eau d’Hermes a leather scent also? I do guess they’ll do an EdT or an EdP eventually, but I wish they’d done it first. This way, it just looks like they are trying to reposition themselves by a step or two. And yes, and so is Bel Ami. Just wasn’t including them as part of the “contemporary” line, that’s all. I didn’t care for it, there was a urinous note that ruined it. Don’t like Cuir d’Ange either, the only one I can appreciate is Kelly Caleche. I liked Bottega Veneta’s take on leather better overall – and lucky me, it’s cheaper too. Really? In the opening, or the dry down? But the Bottega Veneta, good call, it’s less than half the price. If in fact it cost them twice as much to make Galop I’d be surprised, but I’d also say that in that case they wasted their money. Gotcha. I wonder if there’s some grapefruit in there that I’m not noticing. I’ve only tried Galop once, so cannot speak nuances. On my skin it started as quite a dirty leather, which then went quiet and served as a background to rose. Yes, a fruity-spicy rose. I don’t know if it will be very popular (doubt it, really), but I think it could be an instant classic. I’d say it is interesting, intriguing even, queitly beautiful, and yes, very Hermes-y. The best bit: it’s not “me” I won’t lose sleep about not being able to afford it. Will probably buy a bottle of Bel Ami, which I should have done years ago. I have to say though that this new market strategy (if it is a strategy) is making me increasingly grumpy. Hope it won’t last. It is Hermes-y (and loved the article title from Elle that I referenced above). I kind of doubt it will be a huge seller either. Maybe that’s not even what they want, who knows, or maybe they’re planning an “easier” followup in a lighter concentration. I didn’t think this one was difficult, exactly, but it’s not as overtly feminine or “pretty” as I expected. I tried this on skin once and liked it a lot. I really enjoyed the opening and kept smelling my wrist – the citrus & berries were very cheerful to me and lasted longer than I would have thought. I don’t own any rose/leather scents, so happy to add it to my collection via a split from Sat.’s splitmeet! That larger size is certainly more economical. Perhaps one day I’ll splurge on that fantastic bottle. The bottle really is lovely. I hope if they do a lesser concentration, they keep the bottle. Well, the Neiman Marcus display of the little bottles was lovely but the tester was “lost” so I didn’t get to sample. Perhaps it was too obvious that I was tire-kicking and had no intention of buying anything. For that price I could buy a bottle of something on my wish list and snag a “full-sized sample” of something fun from a discounter. Ha, at this point I really need to start wearing a disguise in Neiman Marcus. I do an awful lot of tire-kicking there. At my store, the Galop display was the largest for a single fragrance, which surprised me. I agree with all you wrote. I like the sample of Galop I found online well enough, but didn’t find it compelling enough for a full bottle even before I knew how pricey it was. My favorite part is the effervescent opening which does smell like it has some grapefruit in it to me. I don’t think I’ve ever smelled an actual quince so I couldn’t quite locate that note. However, once the top notes dissipate, which doesn’t take long on me, it smells like a nice, but unexceptional, woody rose. I think it shares a lot of DNA with Nagel’s earlier and much less expensive Chopard Madness. I do confess some nervousness about what direction Hermes will take after Ellena. Galop would fit into the new Vuitton perfume line quite nicely, and now I hear that Christian Laboutin has some perfumes out, too. It does seem that there is a trend of luxury leather companies selling the idea of luxury at a steep premium that doesn’t seem quite justified by what’s in the bottle. Ah, and I don’t know Chopard Madness. I read something about LV releasing perfumes because their sales of leather goods are down, no idea if it is true. But makes sense, everybody wants to get in the fragrance market now that the expansion is all at the high end. Wonderful review. The comments are enlightening, too. That bottle is a stunner, and it’s great there is a refill. I’m just barely coming to an enjoyment of leather in fragrance, so Nagel’s treatment is appealing. I was surprised to read of a fruity/berry note. Somehow I missed that when I read about Galop’s release. I have not tried it, but will look forward to crossing paths with Galop someday. As always, I say “Yes to Hermes!” But perhaps not to a full bottle. I think the only “official” fruit note is quince, so you’ll have to see what you think! I would not buy it or want it though. And that is a major turn in my perfume history! What do I buy now?! It was so easy to have a go to brand where people could just buy a gift (my husband…) or you could just blind buy based on description. Sigh.